We have an exciting new addition to the family - our ever popular, estate grown Brunn Grüner Veltliner will now be available in a 20L Slimline KeyKeg. 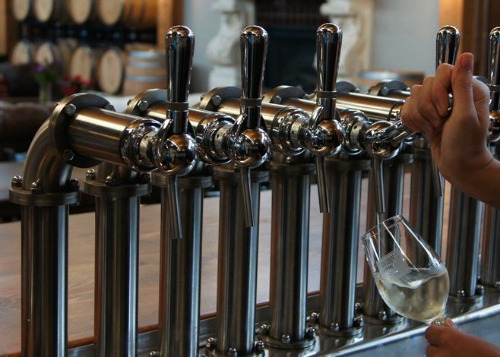 Wine on tap is already very popular in Europe and is becoming a common sight on this side of the Atlantic. Here's a quick overview of some of the reasons bars and restaurants are increasingly carving out room for wines on their tap lines. Perhaps the best known benefit of a keg system is how well it keeps wine fresh. In the case of our Brunn Grüner Veltliner, the KeyKeg Slimline has a similar design to a bag in box (they call their's 'bag in ball'). The wine is held in an aluminum-lined inner bag, surrounded by a hard plastic case. The inner bag is then put under pressure by an inert gas. Thus, the wine never comes in contact with oxygen, meaning a consistently fresh glass of wine. You can watch some nifty demonstration videos on the KeyKeg website, if you'd like to learn more. It is well known that buying in bulk saves you money, and kegs are no exception. This benefit is aided by the fact that wineries save on packaging and shipping when using kegs vs. bottles. On the restaurant level, waste associated with a bottle-based wine by the glass program is eliminated. We all know that every drop of wine that goes down the drain is a small tragedy, but in many restaurants, half-full bottles have to be dumped after being open too long. Heartbreaking. The lowered cost to the environment is also a big advantage to kegs. Our Brunn Grüner Veltliner 20L keg holds the equivalent of 20 one liter bottles of wine. The packaging (bottle, cork, box, etc) for those 20 bottles would weigh approximately 30 lbs. 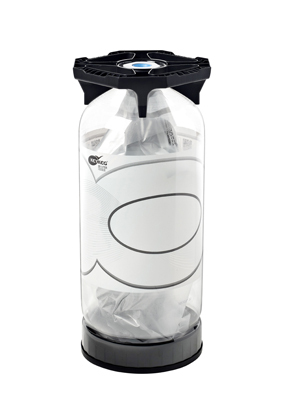 Alternately, one 20L Slimline KeyKeg leaves behind a mere 2.3 lbs of recyclable packaging. (That is over 90% less waste!) This also means reduced shipping cost and less fuel used to transport the wine, leading to a smaller carbon footprint. Let's drink to that! The ability of KeyKegs to keep wine fresh means restaurants and bars have a greater flexibility in how they serve the wine. At Lois, a new East Village wine bar in NYC, their entire rotating list is served through a tap system, with 4 different pour sizes offered (100, 175, 500 & 1000 mls). This means guests have the option of tasting through three, 100 ml glasses of different wines or sharing a 1 liter carafe with friends. The centuries old tradition of wine by the bottle is certainly not going anywhere. Allowing a wine to age and mature, the ceremony of popping a cork, and the beauty and personality conveyed through label design are all features that can't be replaced. However, the savings in cost, environmental benefits and flexibility offered by wine by kegs mean that they're a movement that is sure to grow. And really, who can argue with another way to enjoy wine?